Summary: Seventeen year-old Noreen hasn’t had an easy life. With a mother who is Amazing in name only and a step-father who is abusive, the best part of their marriage comes in the form of Gladys, Noreen’s step-sister. But as the years pass and when Gladys moves out to get married, Noreen starts down a path of self-destruction. Meeting and falling in love with Wesley changes things for a little bit, but at the first misunderstanding Noreen takes off, ending up in Pembina Lake among people who just might be able to help her start over and stop sabotaging herself by being more mindful. Review: True Confessions of a Heartless Girl by Martha Brooks is a favourite of mine, and today as I read it again for what had to be at least my fourth time, I tried to pin down why exactly that is. Part of it is Brooks’ writing style. Her story of Noreen, a girl in flux, flows beautifully and the town she ends up in features complicated characters experiencing their own struggles yet still willing to reach out. Even when Noreen makes mistake after mistake, Lynda, Dolores and Del still strive to teach her and help her grow. I also love Brooks’ way of putting things, from her description of the spectacular sky scape Noreen makes for Wesley, to the way she depicts Noreen’s pregnancy and feelings about it. I also liked the symbolism of cutting one’s hair to show grief. But the main part is Noreen herself. Although she is labelled heartless in the title, Brooks proves to her reader that Noreen isn’t heartless, just misguided. And, at times, a bit thoughtless. I love her as a character though because it’s easy to see why Noreen acts the way she does. She hasn’t had the easiest start in life, and her potential role-models have been less than stellar. When it comes to embracing her step-sister Gladys’ love, Noreen’s reaction to Gladys’ marriage is child-like in her jealousy, but again, there is nothing in Noreen’s life to demonstrate to her love can be a stable act. She expects always to lose the love she receives, and to prevent the hurt Noreen leaves the significant relationships of her life before they can leave her. In spite of it all though, Noreen still has wonderful moments of profound actions of love, and one of the reasons I love Brooks’ book is because as she matures, she learns to embrace them more. Noreen learns to see what she is getting wrong, and tries her best to open herself up to the love around her. It helps that Brooks provides Noreen with other characters she can trust and who return love in different ways; my personal favourite being Wesley. True Confessions of a Heartless Girl simply ends up being a wondrous read in its simplicity, and I’m sure it is one I will continue to re-read. “The girl gave a little sickened movement of her head, a sudden slackening of her dry lower lip. Lynda knew right then that there was trouble. Knew it with a feeling that told her if she was smart she’d just let this kid get back in the truck and get swallowed up by the storm. Life would continue in the same old way. Then she thought back to the day that she herself had been in trouble, the day she first arrived back in town – three and a half years ago, during the misery of a February blizzard. Dolores took her in, her little boy, too. She didn’t have to do that. Nobody had to do anything; it wasn’t a requirement in this life that you burden yourself with somebody else’s baggage. It wasn’t necessary to lay yourself open for more trouble than you already owned. “Right then and there she wanted to get down on her knees and pray to something for help. Except not to a boring old man with a beard, sitting in a chair. But what if God was a woman? What would She look like? Noreen tried to imagine Her. Pictured Her rising up from under the grass, Her head popping out of a hill. Then maybe She would grow tall, Her shoulders rounded with spilling dirt. Her hair would be trees and flowers and long prairie grasses. Her feet would be lakes and rivers and oceans. She would wear a crown of sky, with winds and stars and moon and sun and darkness and planets. She would have a pregnant belly, so big that on stormy days, if you looked up into the sky, you would be inside Her, inside God, and the lightning flashing across would be Her veins. 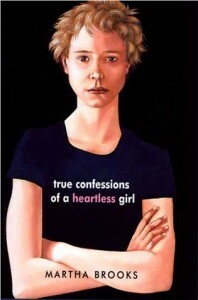 True Confessions of a Heartless Girl by Martha Brooks is published by Groundwood Books, (2002).